Player A is a new contemporary jazz group in Nashville, TN. These top session players have already worked with Chuck Loeb, Luther Vandross, Michael McDonald, Chaka Khan, Jonathan Butler, Kenny Loggins and more greats of the music scene. The band are keyboardist and producer Eric Copeland, bassist Gary Lunn, guitarist Mark Baldwin, drummer Bryan Fullen and saxophonist Sam Levine. The band also works as production team for other jazz artists like guitarist Drew Davidsen, recording with him the albums Around (Again), We 3 Stringz and his 2011 release Spin Cycle. 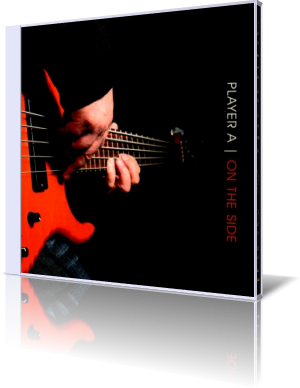 On The Side is the first solo project of this formation presenting finest smooth jazz in the style of Fourplay, The Rippingtons or Jeff Lorber. This EP offers five elegant tunes starting with the slow paced On The Side. A smooth reflection of the same-titled song, Copeland released on his album The Jazz In Me. Gloomy like a summer breeze. The spiritual Gospel standard S&T (Softly & Tenderly) features bassist Gary Lunn, who dedicates his instrument to the worship as a fully functional flowing part of a musical collective that draws people closer to God. Jazz is often associated with the color blue. Jazz habitually uses blue notes. A blue note is a note sung or played at a slightly lower pitch than that of the major scale for expressive purposes. In The Key Of Blue follows this imagination, somehow lonesome and melancholic. The colorful El Caribe reminds of the silky smooth style of the Rippingtons. Alluring and soothing. Mark Baldwin's guitar work is the perfect answer to Copeland's brilliant work on keys. Eric originally composed Come To Me for Sienna's debut album Steps, which was released on his label in 2003. He transfers this soulful melody to an awesome instrumental rendition. Just As I Am is a well-known hymn interpreted by Gary Lunn on bass and elaborated by Eric on piano with atmospheric reverb. This EP is a taste of the upcoming album Our Own Devices, which is scheduled for release in 2011. The songs are contemplative, uplifting and a pledge for the survival of the spiritual dimension of jazz music.